Credit: Image is courtesy of Larry Nittler and NASA. Washington, DC–An ancient sliver of the building blocks from which comets formed was discovered encased inside a meteorite like an insect in amber by a Carnegie-led research team. The finding, published by Nature Astronomy, could offer clues to the formation and evolution of our Solar System. Meteorites were once part of larger bodies, asteroids, which broke up due to collisions in space and survived the trip through the Earth’s atmosphere. Their makeup can vary substantially from meteorite to meteorite, reflecting their varying origin stories in different parent bodies that formed in different parts of the Solar System. Asteroids and comets both formed from the disk of gas and dust that once rotated around our young Sun, but they aggregated at different distances from the Sun, affecting their chemical makeup. Compared to asteroids, comets contain larger fractions of water ice and far more carbon. By studying a meteorite’s chemistry and mineralogy, researchers like the paper’s lead author, Carnegie’s Larry Nittler, can reveal details about its formation and how much heating and other chemical processing it experienced during the Solar System’s formative years. A particularly primitive class of meteorites called carbonaceous chondrites are thought to have formed beyond Jupiter. One such meteorite, discovered in Antarctica’s LaPaz Icefield, is a particularly pristine example with minimal weathering since its landing on Earth’s surface. 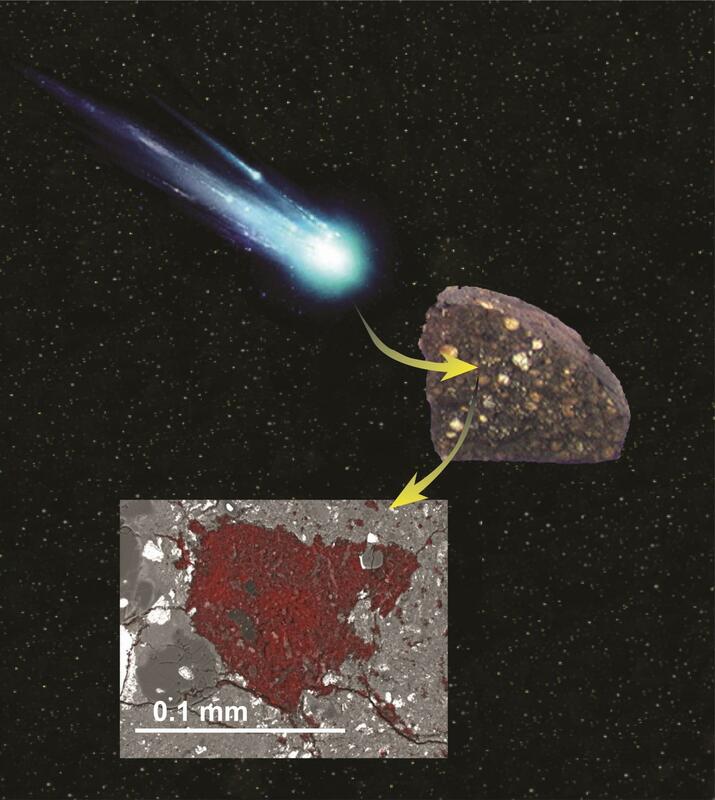 Inside the LaPaz meteorite, Nittler’s team found a very carbon-rich slice of primitive material that bears some striking similarities to extraterrestrial dust particles that are thought to have originated in comets that formed near the Solar System’s outer edges. Approximately 3-3.5 million years after the Solar System formed, but still long before Earth finished growing, this object–about one tenth of a millimeter across–was captured by the growing asteroid from which the meteorite originated. By undertaking sophisticated chemical and isotopic analysis of the material, Nittler and his colleagues–Carnegie’s Conel Alexander and Jemma Davidson (who is now at Arizona State University), as well as Rhonda Stroud and Bradley De Gregorio of the U.S. Naval Research Laboratory, and Josep Trigo-Rodríguez, Carles Moyano-Cambero, and Safoura Tanbakouei of the Institute of Space Sciences in Barcelona, Catalonia–were able to show that the encased material likely originated in the icy outer Solar System along with objects from the Kuiper Belt, where many comets originate. The existence of this primitive material inside the meteorite indicates that due to the drag caused by the surrounding gas, particles like it migrated from the outer edges of the Solar System, where comets and Kuiper Belt objects formed, to the closer-in area beyond Jupiter, where the carbonaceous chondrites formed, revealing details about how our Solar System’s architecture was shaped during the early stages of planet formation. This work was supported by Spanish grants AYA 2011-26522 and AYA 2015-67175-P. and NASA grants NNX10AI63G and NNH16AC42I.